[SA] XT130 Lower Control Arms. Thread: [SA] XT130 Lower Control Arms. 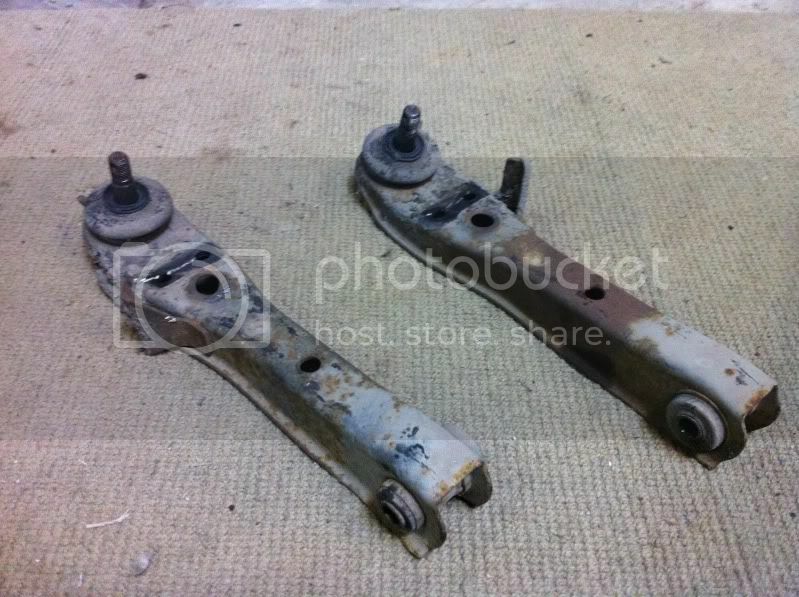 I have for sale a pair of XT130 (RT132 actually, but they are identical) lower control arms. They have literally just been pulled out of my parts car. They have bushes and balljoints in them but they do need replacing, the lock stoppers have not been cut off either. I put a few marks in one of them getting the steering arm off, as you can see in the pictures. If you are a perfectionist like me, i'd get them sandblasted and powdercoated, but a rattlecan works just as well. Would prefer pickup but can post at your expense. there is some ball joints and bushes at the shop if you wish to upsell? I will negotiate reconditioning with whoever purchases them. If these don't sell today or tomorrow i will be getting them sanblasted, powdercoated as well as installing new bushes and ball joints. The price will be going up accordingly.